Joanne Robbins is the Principal and Associate Director of Morningside Academy. Joanne has over thirty years of experience in program development, curriculum design, and teaching and supervision of programs for children, youth and adults. Joanne’s experience has been in both educational and mental health settings. She developed programs for Pre-K through college level. 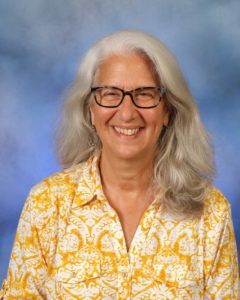 In addition to the gratifying work as Principal of Morningside Academy, Joanne is a founder of P.E.E.R., Partnerships for Educational Excellence and Research. The P.E.E.R. project is designed to radically improve the teaching and learning communities in several township schools in Port Elizabeth, South Africa. Prior to moving to Seattle, Joanne lived in Chicago for many years. While there, she was the Activity Therapy supervisor for a 120-bed children’s state psychiatric facility, served as an adjunct faculty member in the Psychology Department at Northeastern Illinois University, and designed and implemented problem solving and thinking skills programs, study skills programs, and learning acceleration programs for inner-city children and college students for the University of Illinois at Chicago and the City Colleges of Chicago. She also served as program developer and instructor in the federally funded Nation of Tomorrow program, training Chicago Public School teachers how to use computer technology in their classrooms. Joanne served as a research assistant in the Instructional Research and Development Laboratory at the University of Illinois at Chicago. She is a frequent presenter at professional meetings and has published experimental work in human clinical decision-making. Joanne has served as an instructional design consultant to private industry in the production of instructional media including Learning-to-Learn, Inc. in Cambridge, MA, and Focus International, Inc. in Huntington, NY. An expert in the teaching of thinking and reasoning skills, Joanne is the author of Learn to Reason with TAPS: Talk Aloud Problem Approach, and co-author of Fluent Thinking Skills: A Generative Approach. As the parent of graduates of the Seattle Public Schools, she remains involved by advocating for the betterment of the public school system. She served as co-chair of the Seattle Public School Superintendent’s Positive Climate and Discipline Advisory Committee. Joanne earned an MA in Behavioral Sciences (Art Therapy concentration) from the University of Houston, Clear Lake Campus. A native of New York, she earned a BA in Sociology from the State University of New York at New Paltz. Joanne completed her Ph.D. in Educational Psychology at the University of Illinois at Chicago under the mentorship of Dr. Sue Markle, Dr. Phil Tiemann and Dr. Herbert Walberg. Robbins, J. K., Layng, T. V. J. & Karp, H. J. (1995). Ambiguity and the abstract tact: A signal detection analysis. Analysis of Verbal Behavior, 12, 1 – 11. Robbins, J. K. (2002). Effects of setting timed practice aims on problem solving. Dissertation, University of Illinois at Chicago, Chicago, IL. Robbins, J. K. (2004). Problem solving, reasoning, and analytical thinking within the Morningside Model, In K. Johnson & E. Street (Eds.) The Morningside Model of Generative Instruction: What it Means to Leave No Child Behind, Concord, MA: Cambridge Center for Behavioral Studies. Moors, A., Weisenburgh-Snyder, A. and Robbins, J. K. (2010). Integrating frequency-based mathematics instruction with a multi-level assessment system to enhance response to intervention frameworks. The Behavior Analyst Today, 11 (4), 226–244. Robbins, J. K., Weisenburgh-Snyder, A., Damons, B. Van Rooyen, M., Ismail, C. (2011). Partnerships for Educational Excellence & Research International: HPT in the townships of South Africa. Performance Improvement, 50 (4), 31–39. Robbins, J. K. (2011). Problem solving, reasoning, and analytical thinking in a classroom environment, The Behavior Analyst Today, 12 (1), 40–47. Snyder, A., Malmquist, S., Robbins, J. K. & Lipshin, A. (2015). A model of MTSS : integrating precision teaching of mathematics and a multi-level assessment system in a generative classroom. Learning Disabilities: A Contemporary Journal. Robbins, J. K., T. V. J. Layng & P. J. Jackson (1994). Fluent thinking skills: A generative approach. Chicago, IL: Robbins/Layng Associates. Robbins, J. K. (1995). Talk aloud problem solving: TAPS for teachers. Chicago, IL: Robbins/Layng Associates. Robbins, J. K., & Layng, T. V. J. (2010). Fluent thinking skills: A generative approach 2nd Ed. Seattle, WA: P.E.E.R International. Robbins, J. K. (2014). Learn to reason with TAPS: a talk aloud problem solving approach. Seattle, WA: P.E.E.R International. Robbins, J.K. (February, 2017). Presentation: Learning strategies to develop and assess problem solving and reasoning skills, International Association for Cognitive Education in Southern Africa, Cape Town, South Africa. Robbins, J.K. (November 2017) Paper: TAPS: How teaching your learners this strategy is more generative than teaching algorithms. Symposium: Talk Aloud Problem Solving: applications across academic settings. 30th Annual International Precision teaching Conference, FL. Robbins, J.K. (March 2018) Invited paper: Partnerships: The mutual needs of township educational systems in South Africa and behaviorally-based systems in the U.S. 2018 Regional Conference on Behavior Analysis, TX. Robbins, J.K. (May 2018) Invited paper: Why children need to talk to themselves: The foundation of reasoning and questioning. 44th Annual Conference of the Association for Behavior Analysis, San Diego, CA.